We understand that shopping for a mask can be difficult. 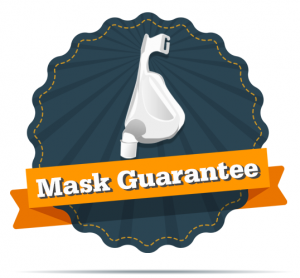 This Mask Guarantee will allow you to return one CPAP Mask System within 30 days for your money back (shipping costs not included). Get peace of mind when you are trying a new mask and no questions asked when you want a refund. Mask purchases made without this guarantee will be subject to our normal Returns Policy which is 100% store credit. Please purchase the Mask Guarantee when your purchase your mask, so both items are on the same order. If you would like to try multiple masks and have the option to return multiple masks, please purchase multiple Mask Guarantee products. *Refunds will exclude cost of the Mask Guarantee and shipping costs. Offer not valid with insurance orders. Please Note: You must purchase your mask and the Mask Guarantee at the same time. Guarantees cannot be purchased retroactively.